The encampment of anti-Capitalist demonstrators on the steps of St Paul’s Cathedral in 2011 presented the Church of England with a fundamental dilemma – should it support a movement that was, prima facie, advocating the values of Christianity or should it act to protect its own property? Steve Waters’ new play gives a fictional account of events at that time, centring on the Cathedral’s Dean, who, having made the decision to close the building to the public, is now planning to re-open it. Tim Hatley’s magnificent set of an ancient office with large windows overlooking a close-up monochrome image of St Paul’s establishes immediately that this will be an impressive production. 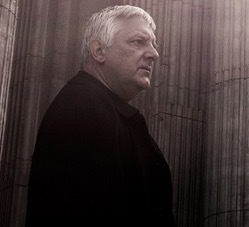 And then the Dean, in the form of Simon Russell Beale, appears to elevate it to an even higher level. Suppressing all the flamboyance often associated with him, he gives a superb, quietly powerful performance as a man whose duties are divided, part humble administrator, part Man of God. He is surrounded by dissenters; the hot-headed Canon Chancellor (Paul Higgins) has resigned on Twitter and the traditionalist Virger (Anna Calder-Marshall) follows suit on paper. The Bishop of London (Malcolm Sinclair) is an adept politician, equally skilled at both sitting on the fence and passing the buck. The Dean’s new temporary PA (a beautifully judged comedy performance by Rebecca Humphries) tries to provide support, emphasising her qualifications as the daughter of a rural vicar and an almost graduate in History. Shereen Martin gives an excellent cameo as an icy lawyer representing the City of London, urging the Dean to put his name to action seeking a Court injunction to remove the protesters. Waters tends to play too long on the singles joke of the fusty Clergy tackling the world of texts, Twitter and the like, but, otherwise he and a fine company under the direction of Howard Davies give us an utterly compelling 90 minutes.